You did a great job with our CAS sketch! LOVE your trendy hexagons!!! So glad you played along in our first challenge over at CAS(E) this Sketch! I think you rocked the CAS style with this one! Those hexagons are awesome and the colors are super cool. Thanks for playing with us at CAS(E) this Sketch, we loved having you! Well, I think you have CAS sorted!! This is really a very elegant birthday card. Love those colours too. You have totally rocked this CAS card! Love those fab colours and what a cool backdrop for your photo! 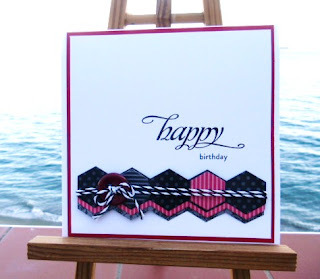 Gorgeous Hexagon CAS card so trendy right now and your colour choices .....perfect! Hope the cold gets better now your on antibotics. You are definitely better at CAS than you are giving yourself credit for. The use of hexagons is perfect - AND your patterned paper in various directions is the perfect interesting touch! So glad to see you at CAS(E) this Sketch! Hi Sylvie, sorry you're still not well. Hopefully you'll start to pick up now you've got antibiotics. Fab CAS card - I love the colours. Thanks so much for coming over to my blog and becoming a follower - I'm following you now!